The guides on fishing rods are vulnerable to breaking. Fishing rods break from time to time, but it is more common for rod eyelets to break. 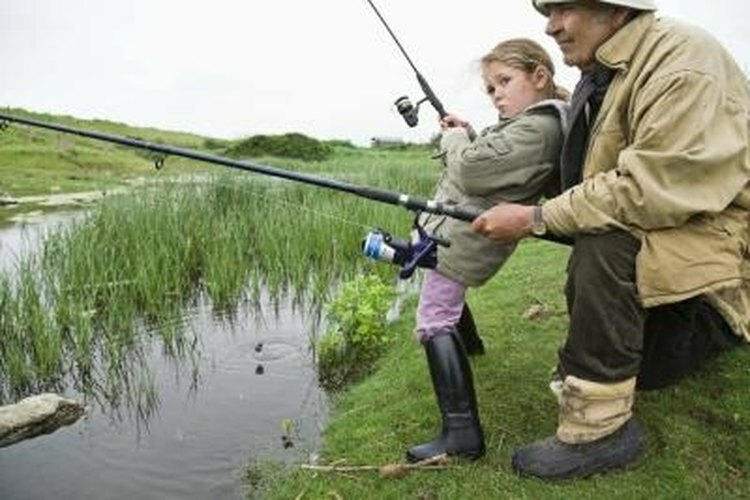 The eyelets, also known as rod guides, are the circular objects that run the length of fishing rods. They lead the fishing line from the rod tip to the reel. When fishermen break eyelets, they generally cannot use the rod until the eyelet is fixed. While some anglers take their rods to a tackle shop for repair, it is possible to repair broken rod eyelets at home. Pull off the eyelet and the thread that held it to the fishing rod. Hold the new eyelet against the rod at the same spot where the old eyelet was connected. Wrap thread 10 to 20 times around the new eyelet and the fishing rod. The thread should hold the eyelet in place. Position the new eyelet so it is in line with the rod's other eyelets. Coat the thread with lacquer. Allow the lacquer to harden fully before using the fishing rod.